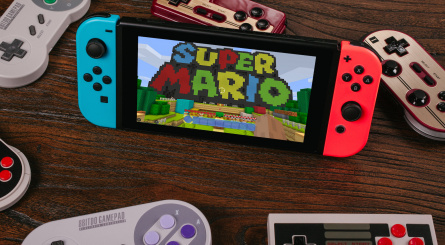 Peripheral maker 8Bitdo has released a new firmware update for its controllers which enables support for the Nintendo Switch. The range of pads - which includes the NES30 and SNES30 controllers - are based on classic Nintendo products and boast an exceptional build quality. 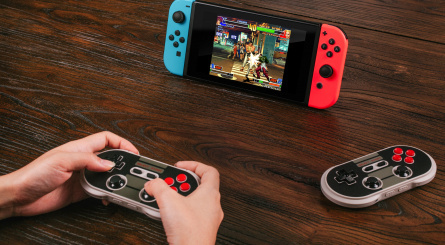 While there are obviously some caveats - rumble, motion control and NFC aren't included - the fact that these pads boast proper D-Pads will make them of particular interest to those of you who intend to purchase Ultra Street Fighter II: The Final Challengers, or have already bought any of SNK's one-on-one fighters for the Switch, such as Garou: Mark of the Wolves or The King of Fighters '98. 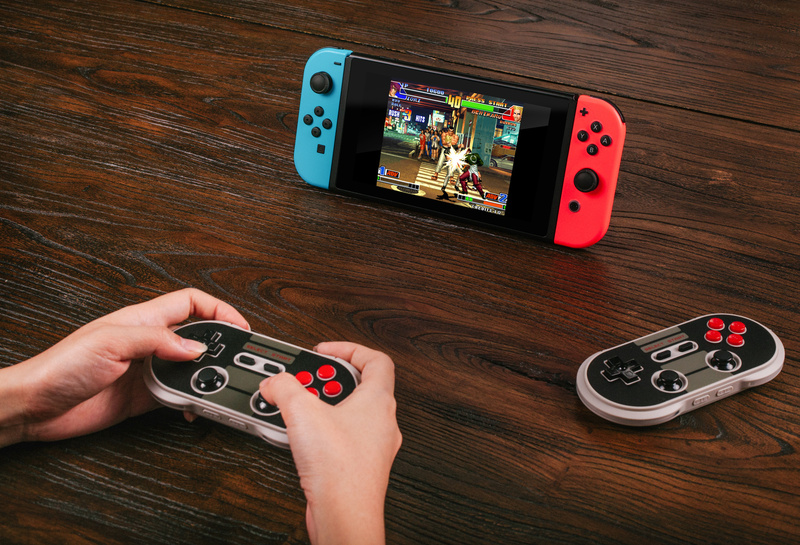 We've downloaded the firmware and updated our pads, and the results are brilliant - it's just like playing Street Fighter II on the SNES back in the day, in fact. 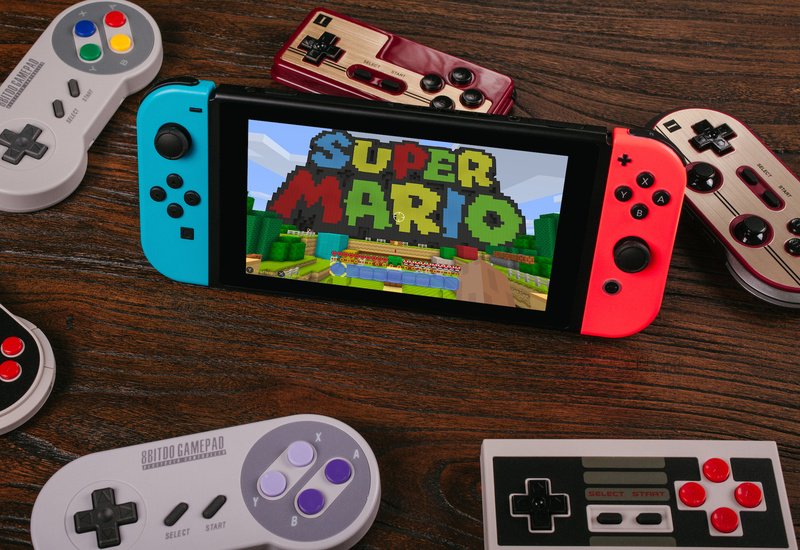 In addition to the Nintendo Switch, all 8Bitdo controllers are compatible with Windows, Android, MacOS and Steam. 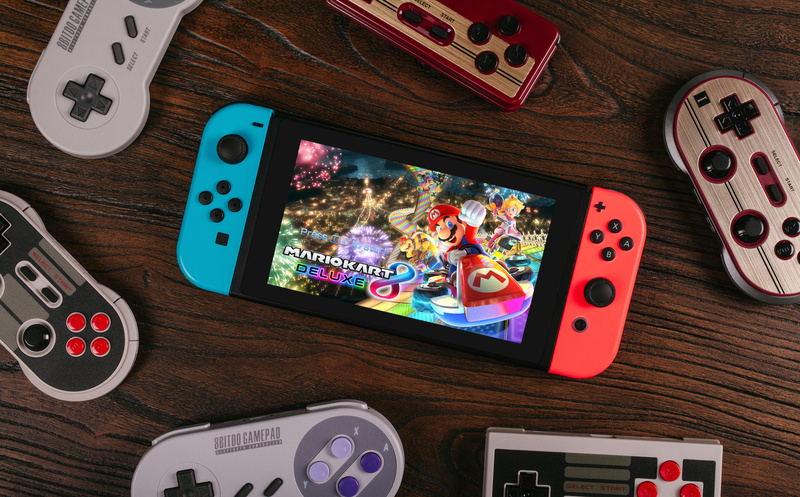 8Bitdo also stresses that the non-Pro options will not be compatible with all games due to a lack of inputs, and recommends the NES30 Pro and FC30 Pro as they offer fully mapped button configurations for the Switch. If you don't already own one or two of these excellent pads, then now is the perfect time. I'm receiving mine today... This is an unexpected bonus ! What, Switch supports unlicensed pads?! That will surely be patched out? Oh if this works with Garou as well I am absolutely loving this! Those controllers do look like they have an exception build quality! Words! Probably just going to stick with the Pro controller. This is good news though. This is awesome. Looks way more appealing than spending $70+ on a Pro Controller. 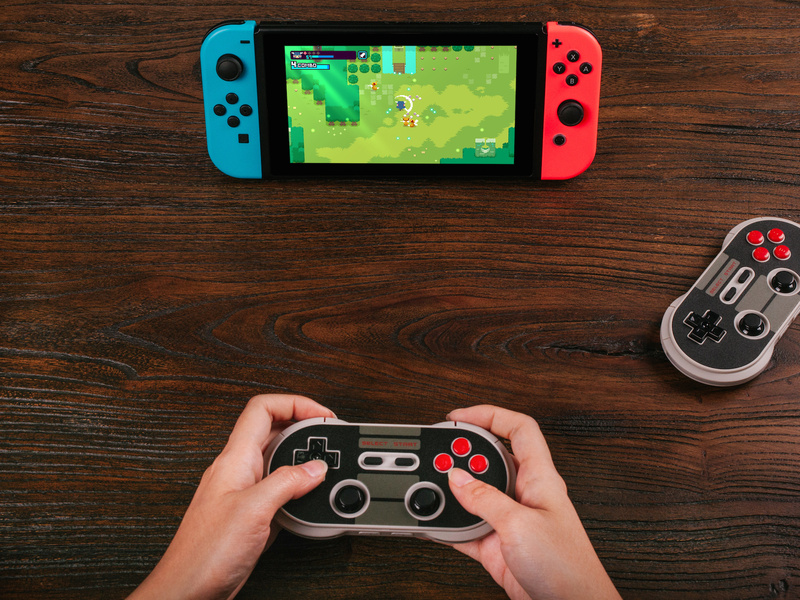 The 8bitdo FC30 pro Wireless Bluetooth Controller looks amazing. That classic SNES one looks good too... Makes me want to get it for my pc and phone. Also, these prices are way cheaper than what's on Amazon. How hard is this to sync with the Nintendo Switch? Does the Switch just automatically detect the pad after you've updated the controller or what? @RedMageLanakyn I've got the 8bitdo SNES30 and it's a well made bit of kit. This is quite possibly the best news ever! Not only is there a 3rd party Switch controller out but I already own it! @Ralizah It varies from pad to pad, but it's pretty straightforward. I want that SNES controller ! Hmm? They look ok but I need to actually hold one for myself to experience the comfort especially the dpad. Allowing synchronization for the Wii U Pro controller will do..
@Shufty I was just poking fun at Damien for yet another spelling error. They certainly look well built, i might have to grab one at some point. @RedMageLanakyn think he'd corrected by the time I saw the article. I have a NES30 Pro and it is a great little controller. I now have a 4th controller for MK8D. Thanks for the update, NL! I'm definitely getting the SNES30. Thank you for the info! The one they link to has some add-ons. @Bunkerneath: no, and the NL article accurately states that. I have the NES, SNES & pro controllers and they work great. I highly recommend them. @Jaxad0127 that one is cheaper but you have to pay shipping. So it comes to the same price either way. The linked prices are phony. @Damo Awesome. I'm dangerously close to purchasing the NES Pro Controller. @setezerocinco Worthwhile sacrifices to drop the price, imo. I wish Nintendo provided budget pads like this. Now I'll definitely pick up a couple whenever they go on sale at Fry's again. Thank​ you 8bitdo. Nah, already got a couple of pros. @Ralizah I use a NES Pro for my Retro Pi, it's awesome to use. I'm gonna set mine up today. I have a NES30 Pro, really awesome controller, happy to use it on my switch. Maybe it will replace my pro controller for on the go? It's much smaller. Very slick looking pads. Part of me wants an NES30 and SNES30 for those 8 & 16 bit retro games, but....so many of them include rumble support, it would be a bit silly to not play them on the legit controls. Even without the D-Pad. I've wanted one of these for a while, this is just sealing the deal. FC30 here I come! Cheaper by far than the pro controller and of outstanding quality. I have the NES pad and it's my go-to when playing retro games. Excellent value. Do they make a non-retro version? But simce you own them, let me ask you a question: are these meant to work with EVERY Switch game or only select ones? To be clear, I'm talking about the Pro versions which come with the full suite of inputs, so you should also be able to play Zelda or Skyrim with them, right? It is a bit of a shame that Nintendo has not (so far) allowed the use of a WiiU pro controller on the Switch - I'm sure a lot of the early adopters will have one. I'm sure it would not take a lot of effort, but I guess it would cut into the sales of the Switch Pro controller. Does this include their diminutive Zero model as well? A PAL-SNES version with colourful buttons is also available. I don't know why NL didn't link to it. It doesn't have motion sensors or NFC so it won't work with every game. But so far no game requires those features. Arcade stick updated too? Hasn't been an update since Jan 2016 for it. But god I love that stick! Use it along with all my other 8bitdo controllers on my Retropie. 'Ma chi se li incula?' - cit. @Arehexes How are the shoulder bumpers in terms of comfort and accessibility? Great. I have both the NES30 and SNES30. They are really some fantastic controllers. But I do not have a Switch yet. 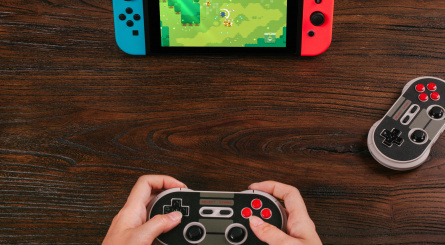 Have someone tried the 8Bitdo Mobile Xtander with the Switch? Does it fit? @Ralizah I don't mind it, if you wrap your pointer fingers around the rim you can hit them both with out issues. My only compliant and I'm not sure if it's my unit, but the battery life is a bit crap. It did feel good playing NES games with them. @Arehexes Amazon page says 20 hours. I'll keep that criticism in mind, though. Thanks! Oh man I've been needin' a reason to get one of these. Woah, I need to get one of these. I'm on my 4th defective Pro controller, and all I want is a working D-pad. I will be getting 2 of those. If Nintendo patches those out I will never forgive them and move onto PS4 to play PS4 and my 3DS. So don't you do it Nintendo. I don't need to buy a pro controller to get a d-pad anymore!!! I have the NES30 Pro and I highly recommend it to everyone. These don't work on Wii u do they? Pity. I actually have only used mine on an original NES, SNES, mini NES and on the Wii U. They worked great on all systems, and feel exactly like the original NES or SNES joysticks. You need separate adapters to use them on those systems, except the Wii U, where it just sinks like any other joystick. I've only played BoTW and 1 2 Switch on the switch, so using them with SFII will be my first use of them on the Switch. On the Wii U, I used the pro controller for NSMBU and it worked flawlessly. The hard part was sinking it up, which took a while...not sure why, but once it was sinked, it worked perfectly. @clvr Pro controller is better as a traditional controller and Joy-Con are more versatile. @SanderEvers really? Cool. They need to advertise this feature. I guess it emulates a pro controller. I may have to get one, love the fact that it would move forward with me when I buy a switch. This is cool, but I'll be grabbing that Hori Fight Pad. @countzero I'm pretty sure that The gyroscope puzzles in BotW probably aren't playable with these, but the rest of the game should be fine. 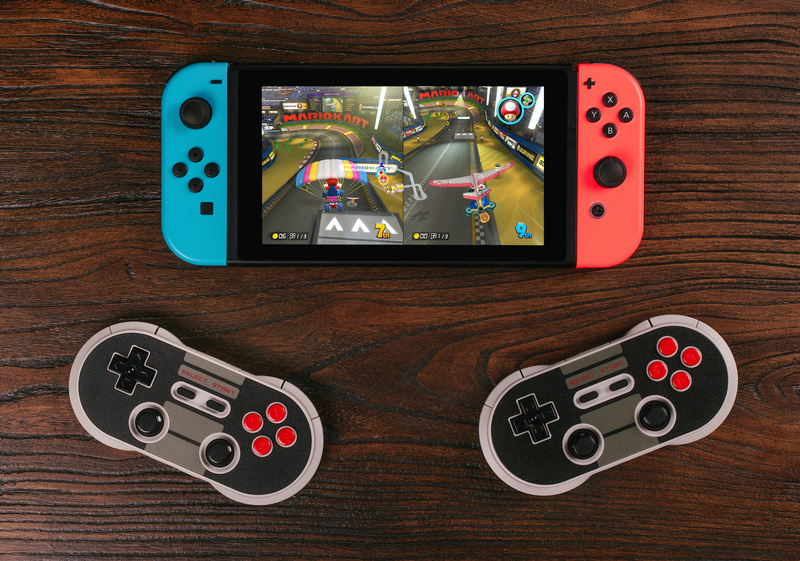 @clvr The Pro versions act like a Pro controller in terms of inputs, so yeah - these will work any game that has that support (or support for Joy-Cons in the Joy-Con grip). I use an 8bitdo on my Super Famicom and love it. This is great news. I suspect Virtual Console will go live at E3, so this is probably very timely of them. They feel exactly like the original NES & SNES pads and the Pro controller is great. The buttons feel like Nintendo made buttons. I just ordered a 2nd SNES one so me & my wife can play SFII at the end of the week! Ok, now show some VC Nintendo, please! Look great, small enough to carry around and over half the price (and functions) of the official pro controller. Fantastic. The 20 hour battery life is a bit of a bummer compared to the 70 hour life of the official controller though. 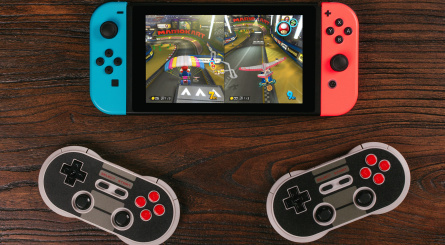 @retro_player_22 I'm going to stress that this possibly is going to be a better option even compared to the Switch pro controller for anything that uses the Dpad. The Dpad on the Switch Pro Controllers are BAD. So I'm looking into this because it's reasonably priced and looks pretty damn good. @Agent721 @Damo thank you both for your kind replies! FYI, I used the pro controller last night on Breath off the Wild and it was very easy to set up and it works great! They have instructions online that tell you exactly how to sink it with the Switch and it worked in a few seconds. The Wii U took forever in comparison, so this was a huge improvement. Sorry guys for asking an strange question on this Nintendo fan site but... does this controller work with PS4? I see Wii/Wii U, and PS3 supports but they are greyed out though. Has anyone else had a problem with the FC30 PRO. I got it to connect once but am unable to connect again. I have tried 20+ times but I just get the continuous blue flashing on the pair mode and it won't connect. I have updated it to version 4 and I use the power button and y. Any help would be much appreciated. Sent back to Amazon and got a refund. I did email the makers but they said to re download the upgrade again which I had done twice already. Going to stick with official controllers me thinks.